Maximize your new closet design with the ClosetMaid Impressions Top Shelf Kit. The shelf helps you gain extra storage above hanging rods and fits between two Impressions closet towers or attaches to the wall, offering a great space to store seasonal items. This shelf is beautifully finished in embossed chocolate with decorative moulding for a polished look. Premium wood shelving transforms a storage space into a designer solution. Beautifully crafted ventilated wood shelving has an elegant look and is perfect for entry ways, common areas, mudrooms, laundry rooms and closets. The kit includes everything you need to quickly install in any space. Use the ClosetMaid Selectives 3-Shelf Stackable Organizer to create your dream closet. The shelves are crafted of durable laminate and finished in smooth white with soft, rounded edges to protect your clothes from snags.It features 2 fixed shelves and 1 fully adjustable shelf for versatile storage. Stack 2 units together to create a tower and maximize your closet space. ClosetMaid Style+ is a stylish, yet affordable organization solution. The clean, versatile design creates shelving storage in closets and throughout the home. Personalize towers and increase overall shelf space by adding Additional Shelves. This lets your creativity take control. The melamine finish also increases durability. ClosetMaid Style+ is a stylish, yet affordable organization solution. The clean, versatile design creates shelving storage in closets and throughout the home. Personalize standard towers and base units by adding Angled Shoe Shelves. Shoe shelves provide storage functionality while displaying your shoes. Impressions 48-inch Top Shelf Kit in Chocolate Maximize your new closet design with the ClosetMaid Impressions Top Shelf Kit. The shelf helps you gain extra storage above hanging rods and fits between two Impressions closet towers or attaches to the wall, offering a great space to store seasonal items. This shelf is beautifully finished in embossed chocolate with decorative moulding for a polished look. 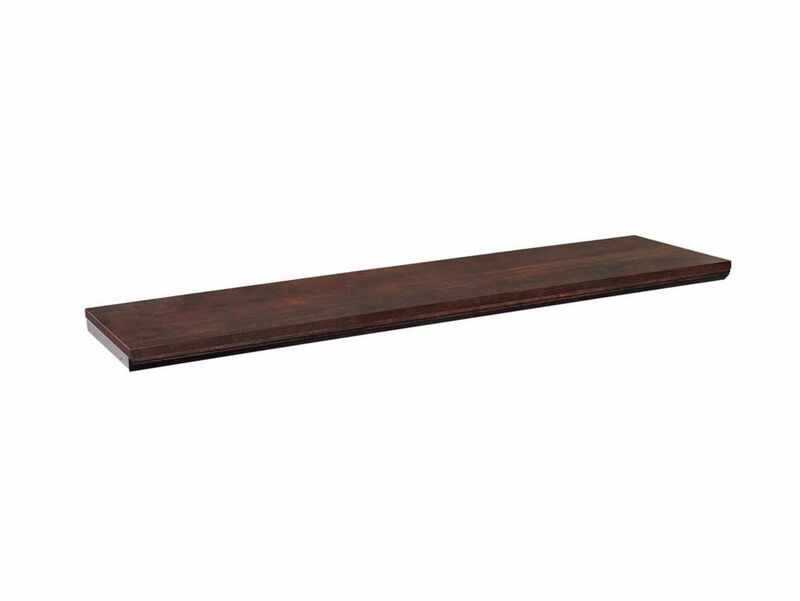 Impressions 48-inch Top Shelf Kit in Chocolate is rated 3.9 out of 5 by 49. Rated 4 out of 5 by Sal from Was easy enough to cut to size and install. Looks... Was easy enough to cut to size and install. Looks great installed with the rest of the closet system. Rated 4 out of 5 by huskyheaven from no damage when opened. assembly was pretty straight forward. Pleased with finished product. no damage when opened. assembly was pretty straight forward. Pleased with finished product. Rated 5 out of 5 by CF from Professional appearance and easy to install. Great finishing touch with the rest of the Impressi... Professional appearance and easy to install. Great finishing touch with the rest of the Impressions closet series to give a full custom closet look at a fraction of the custom price. Rated 4 out of 5 by Closetmaid from I ordered 5 shelve assembly’s. Most of the corners were dinged up but I had to cut them anyway so... I ordered 5 shelve assembly’s. Most of the corners were dinged up but I had to cut them anyway so no big deal. One shelve box had been opened before and the hardware was missing. This was a big deal! Since I ordered online it will be a big hassle to get the hardware replaced. Rated 3 out of 5 by StanFam from This gives a nice look but you will need a saw if your going smaller than 48" and the brackets ar... This gives a nice look but you will need a saw if your going smaller than 48" and the brackets are not a dark color to match the shelf. I think this is a little pricey for what it is.